You can whip this snackable bowl up in under thirty minutes and chill on the couch while you indulge. The creamy cinnamon cashew dip tastes kinda like that amazing white cream cheese frosting you might find on a giant cinnamon bun. So feel free to eat it by the spoonful or drizzle it on anything and everything. Kinda has a raw cashew cheesecake taste too. I definitely ate some of this by the spoonful! Try the dip/sauce on oatmeal, pancakes, waffles, ice cream, almond butter toast and any naked cinnamon rolls you may have lying around. Because, don't you always have naked cinnamon rolls lying around this time of year? Pro-Tip: No time to bake the fries? Or just want to try the dip with something else? Try apples! This dip is also delicious served with sliced fall apples or your fave veggie sticks. For apples: toss apple slices in a bit of lemon juice, cinnamon and smoky paprika. 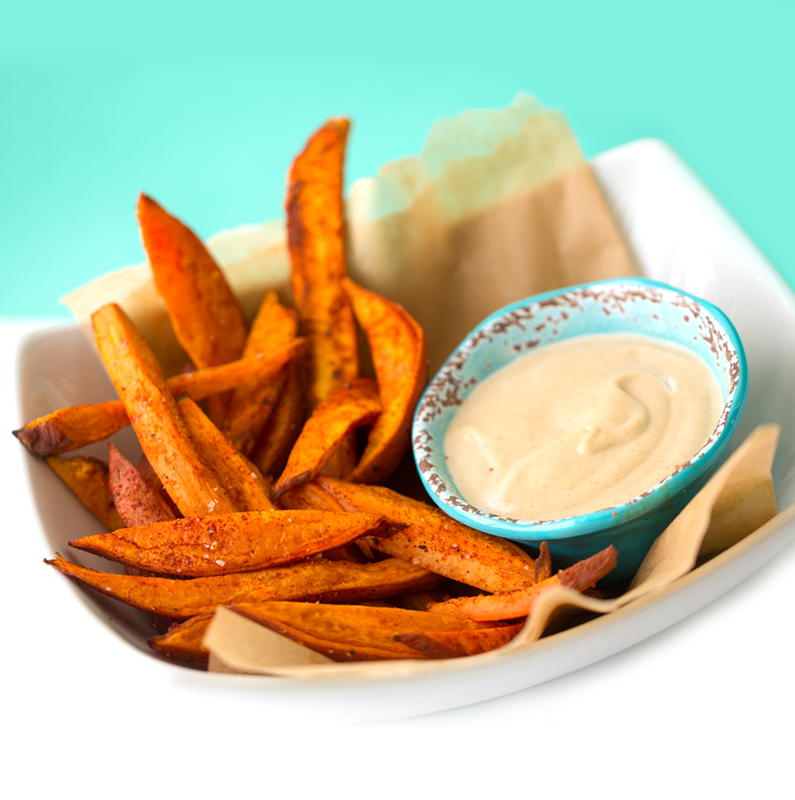 Then serve them with the cashew dip for a fry-free version of this recipe! Dip Note: You could also sub the cashews with walnuts for a different flavor, more rustic and hearty I would say. Super Spiced? 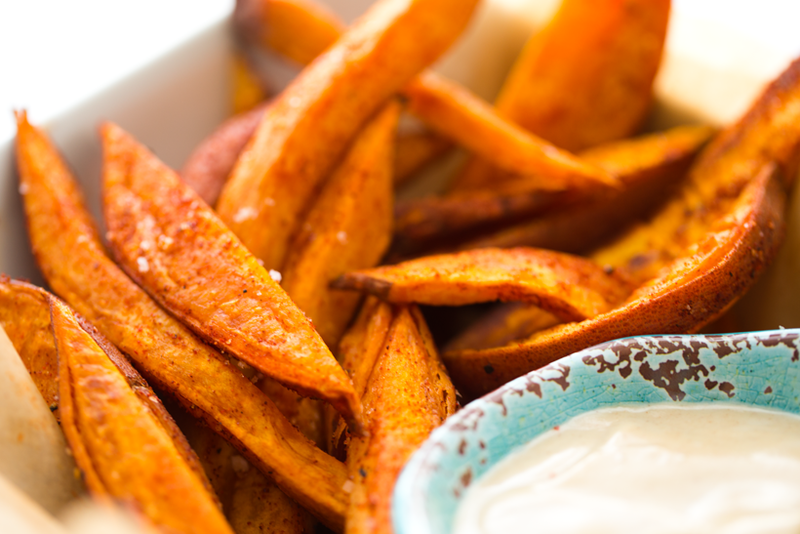 You can absolutely crank up the warmth on these fries by adding more smoky paprika, some ground black pepper and even a pinch of cayenne or chipotle powder. 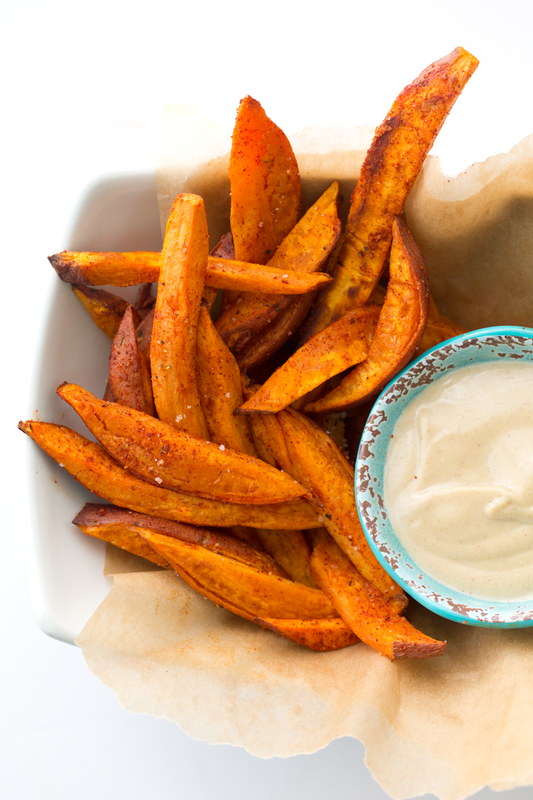 These sassy-sweet, baked sweet potato fries are an easy, totally cravable treat. 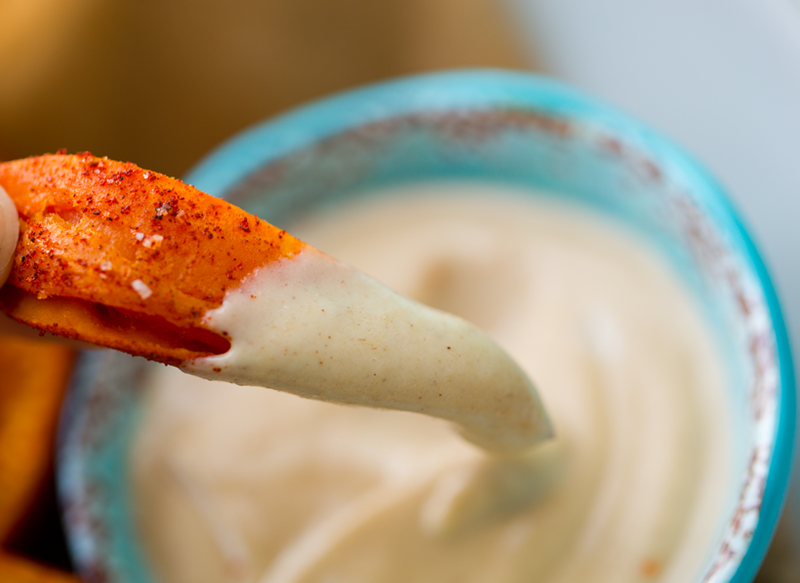 The cashew dip is simply dreamy! Preheat oven to 450 degrees and line a baking sheet with parchment paper - or grease with oil. In a large mixing bowl, toss the sliced potatoes with the oil, coating all sides evenly. Lay the potatoes flat on the baking sheet so that they are flat and spread out as much as possible. Bake at 450 until the edges brown and the fries are tender and slightly crispy - this should take about twenty minutes, depending on how thick or thin you sliced your fries. 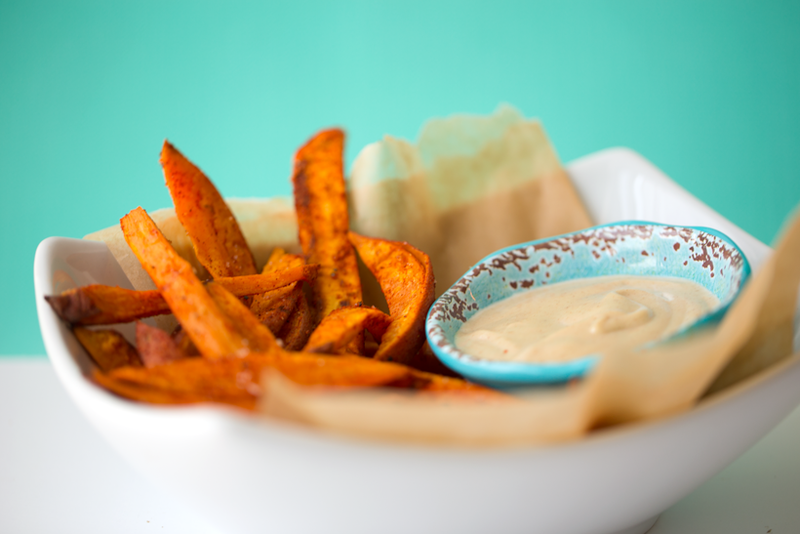 Allow fries to cool at least ten minutes, then gently pour them into a large mixing bowl and toss with the smoky paprika, salt and pepper. 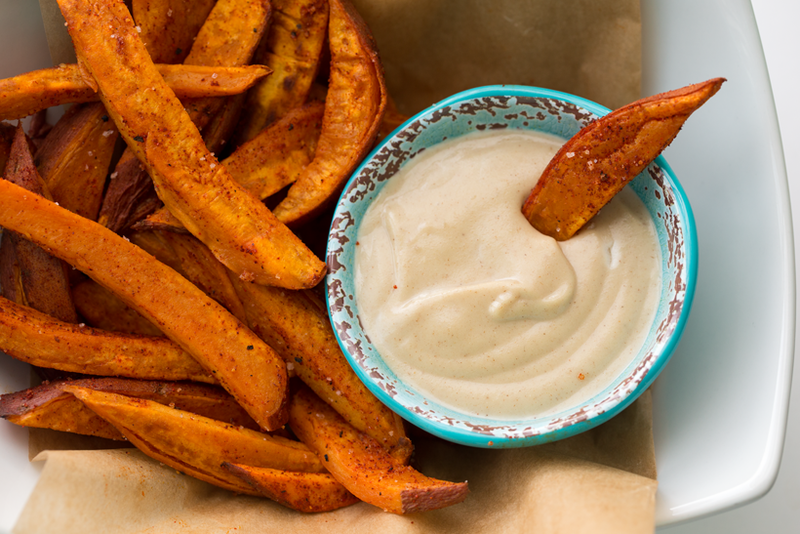 Serve the warm fries with the creamy cashew dip!